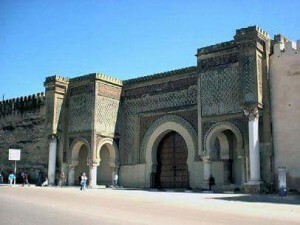 Morocco officially the Kingdom of Morocco, is a country in the Maghreb region of North Africa. Geographically, Morocco is characterized by a rugged mountainous interior and large portions of desert. It is one of only three countries (with Spain and France) to have both Atlantic and Mediterranean coastlines. The Arabic name al-Mamlakah al-Maghribiyah (Arabic: المملكة المغربية‎, meaning “The Western Kingdom”) and Al-Maghrib (Arabic: المغرب‎, meaning “The West”) are commonly used as alternate names. Morocco’s predominant religion is Islam, while the official languages are Arabic and Berber. Moroccan Arabic, referred to as Darija, and French are also widely spoken. Morocco is an influential member of the Arab League and a part of the Union for the Mediterranean. It has the sixth-largest economy in Africa.